In the 1990s there will be millions of personal computers. They will be the size of notebooks today, have high-resolution flat-screen reflexive displays, weigh less than ten pounds, have ten to twenty times the computing and storage capacity of an Alto. Let's call them Dynabooks. He was right. His Dynabook design was the first laptop and tablet concept ever. And his idea of always-connected mobile computing is exactly what we have today. Not only he came up with these ideas out of nowhere, but he was also responsible for the overlapping windowing graphical user interface of the Alto. That GUI was the base for the Macintosh, and all the computer user interfaces we use today—except for our iPhones and Androids. Or the iPad, when it comes out. I didn't see the quote back then, but his judgement seems to me spot on. 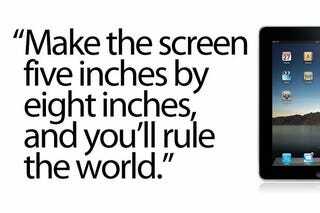 The quote was in a presentation by Evan Doll, from his class at Stanford about designing user interfaces for the iPad. In that slide, Doll quotes Kay, listing then why the iPad's user interface will change computing as we know it (something that I also said before it came out. Obviously the magic rainbow pills are working). Beyond Doll's rationale, however, I find particularly interesting that Kay—the guy who invented mobile computing and the windowing interface—is now behind the idea of a modal, always-connected tablet. Hopefully, he will be right as he was with the Dynabook.